“Blue Vessel” is a mobile web app that creates a delineated experience of browsing knowledge and writing stories of conquest and survival. Hosted on a server located on a flagless ship, drifting on international waters, the app invites users to write anonymous web messages by selecting words solely from the book ‘Robinson Crusoe’ by Daniel Defoe. The written message then becomes a URL, to be found by chance by an unsuspecting viewer, or never found at all. Like a contemporary ‘message in a bottle’, the words are sent with hope of being discovered; it is within this periphery that the act of submitting information becomes futile, and where questions of being seen or never seen at all lie in a state of limbo. The user can also learn survival skills from website links in a browser that decomposes with each scroll movement. Although the links are still active and accessible, the letters on the screen float and bump into each other, ultimately becoming unreadable. Whether our deepest confessions are influenced by machine learning algorithms & words suggestions, or adventures are postponed for endless labyrinthine research, the virtual world is reshaping our relationship to the real one. Sentiments of disconnections, even frustration among the users, are coins used by the artist to highlight the information systems, and the power of their interfaces. In this work, Farber takes the user on a voyage across the unseen spaces of digital communications. 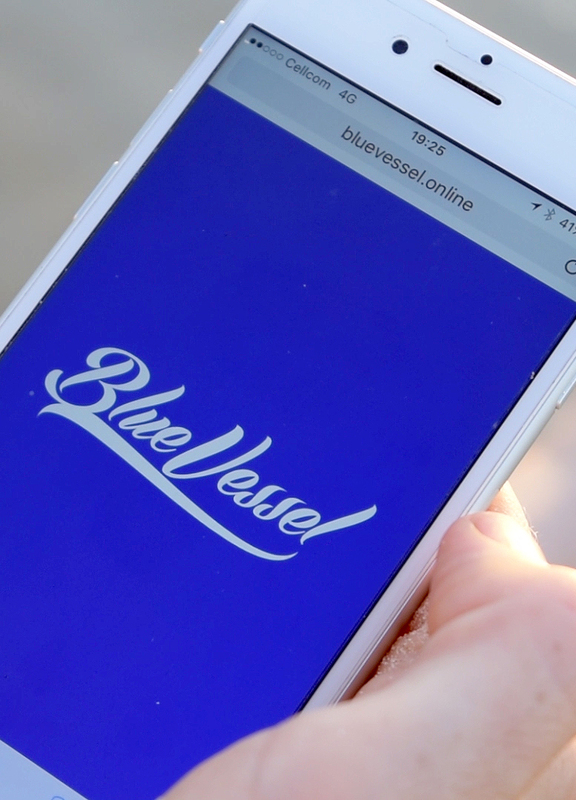 Through the redesign of the familiar features of a mobile app, Blue Vessel uses smartphone technologies as active agents in URL and IRL interactions, exploring new forms of Colonialism in the Internet era. Liliana Farber is a visual artist born 1983 in Montevideo, Uruguay, currently living and working in New York. Farber is a MFA student at Parsons Fine Arts; previously she completed the Postgraduate Fine Art Studies at the Hamidrasha School of Art, Beit Berl College (Israel), and holds a B.A in Graphic Design from O.R.T University in Montevideo. Farber had received the Network Culture Award from Stuttgarter Filmwinter Festival, the Art and Technology Award from the Montevideo City Hall and an Exellency in Art Award from the Israel Ministry of Immigration and Absorption. She participated in numerous exhibitions around the world, including: Ars Electronica Festival in Austria, WRO Media Art Biennale in Poland, FILE Festival in Brazil, Ex-Teresa Art Center in Mexico, The National Museum of Visual Arts and Zorrilla Museum in Uruguay, MECA Mediterráneo Centro Artístico in Spain, National Museum of Fine Arts in Chile and more.